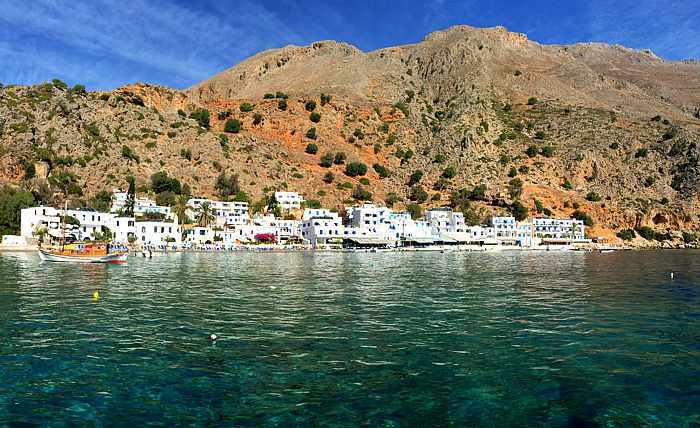 Crete shines: Millions of travellers around the world have spoken, and their positive reviews, ratings and comments have landed Crete island in 4th place on the prestigious TripAdvisor listing of the Top 25 destinations in the world this year. The 2019 TripAdvisor Traveler’s Choice awards were announced this week (on March 26), lauding London as the #1 destination in the world, followed by Paris, Rome, Crete, and Bali in Indonesia. Last year Crete placed fifth, behind Bali. TripAdvisor is the globe’s largest travel website, containing listings for more than 156,000 destinations. Each year it presents its Travelers’ Choice awards to top international destinations, honouring the places that are most popular with people who post reviews on the website. 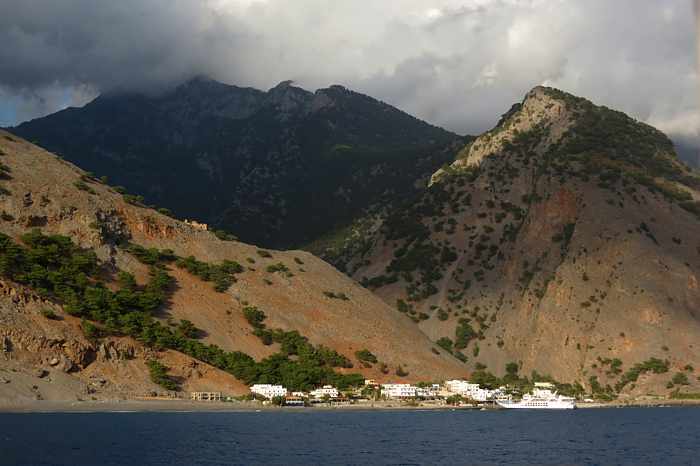 A view of Agia Roumeli village, situated at the foot of the world-famous Samaria Gorge. 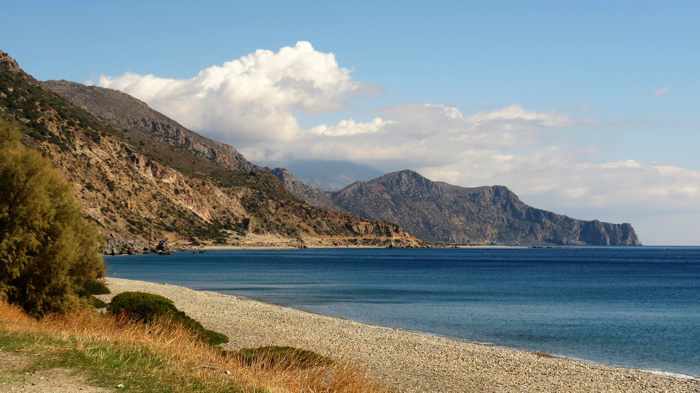 Extending for 16 kilometers, the gorge is the longest in Europe and is one of Crete’s top tourist attractions. 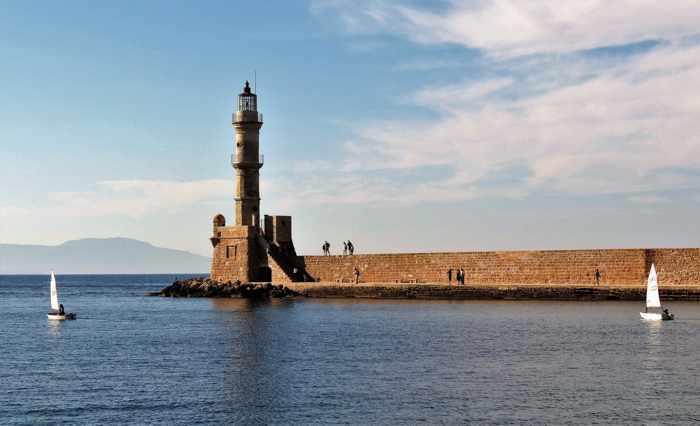 We spent more than two weeks on Crete in late fall of 2017, and could easily see why it has been ranked among the world’s Top 5 travel destinations two years in a row — it truly delivers outstanding travel experiences. Crete has something to suit every traveller’s taste, style and budget: fascinating cities, towns and villages; vibrant resorts; breathtaking landscapes, stunning scenery and gorgeous beaches; superb food and wine; significant historical sites and attractions; a diverse range of outdoor activities for all ages and lifestyles; myriad hotel and lodging options, and much more. 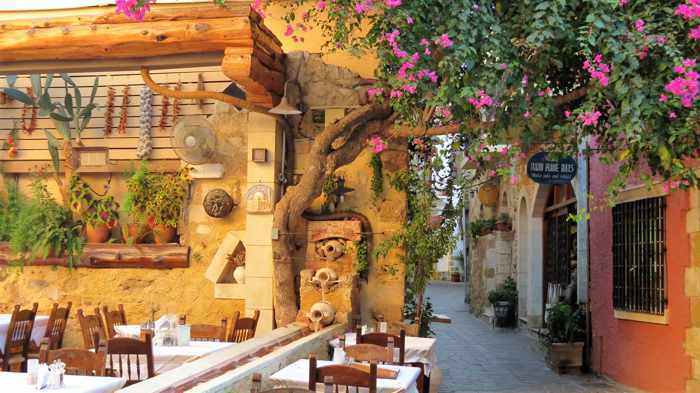 Greece in general fared well on other top rankings, particularly for hotels, where it won top honours in two categories. It nabbed the number 1 and 2 spots in the Top 25 all-inclusive hotel ranking, and it claimed the number 1 and 3 position on the awards list for the world’s Top 25 Small Hotels. Greece also achieved Top 25 rankings for best hotels, luxury hotels, best service, romantic hotels, family hotels, and bargain hotels. I couldn’t help but chuckle when I read that Greece received TripAdvisor recognition for the world’s top two all-inclusive hotels because, in TripAdvisor’s own travel forums, regular visitors to Greece routinely advise travellers to avoid all-inclusive properties, urging them to stay at hotel or self-catering accommodations instead. In essence, the forum commentators claim Greece simply doesn’t do all-inclusives very well, and visitors don’t experience Greece if they stay at an AI resort. With this year’s awards, however, it’s quite clear that all-inclusive resort guests disagree! 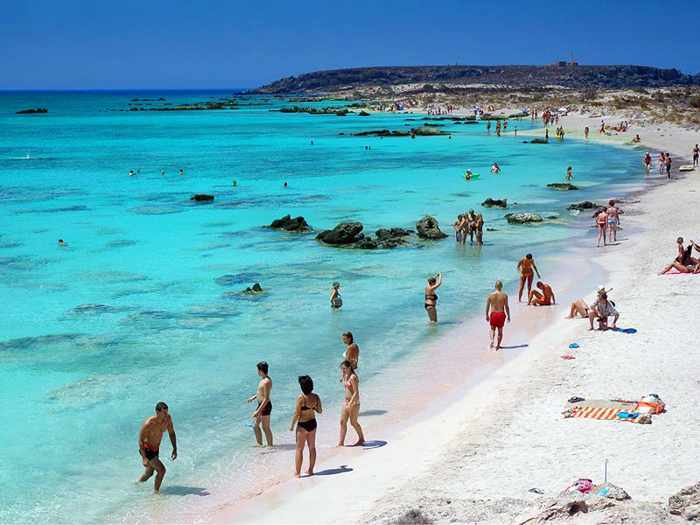 Famous for its brilliant turquoise waters and pink-hued sand, Elafonissi beach is seen in an image from the Elafonissi page on the Cretico Blog. 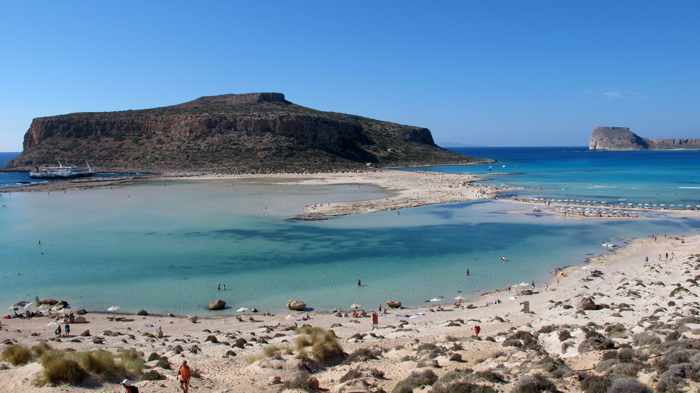 Elafonissi ranked #21 on the TripAdvisor list of the Top 25 beaches in the world. Lagoons and sandy beach strips at Balos are seen in this photo shot by Antoine Nikolopoulos of Odyssey Art Photography. Balos ranked #15 on this year’s list of the world’s top beaches. 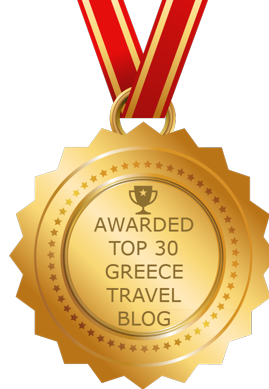 Please click on the link below to continue reading on page 2, where I have posted photos and rankings for the Greek hotels that placed in the world’s Top 25. 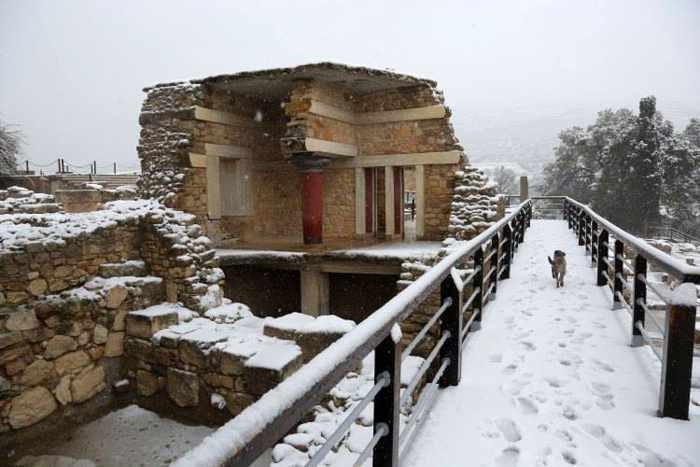 Maria Theofanopoulou captured this beautiful photo of the snow-dusted Acropolis in Athens on the morning of Tuesday January 10. She shot the image from a rooftop vantage point at the Electra Metropolis Athens hotel. 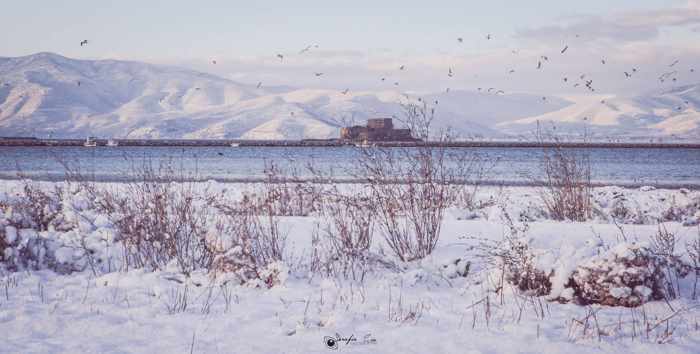 Surreal snow scenes: Since the Christmas holiday period, I have been fascinated viewing hundreds of images of stunning winter scenery that people throughout Greece have been sharing on social media. Although the news feed for the MyGreeceTravelBlog Facebook page is usually filled with breathtaking photos of beautiful beaches, stunning seasides, charming villages and historic monuments, I have been surprised to see that familiar places look almost completely different under dark, stormy skies and blankets of crisp white snow. At times the pictures of snow-covered beaches, ruins and villages in Greece have seemed surreal to me, especially since there is almost no snow anywhere near my home in downtown Toronto. 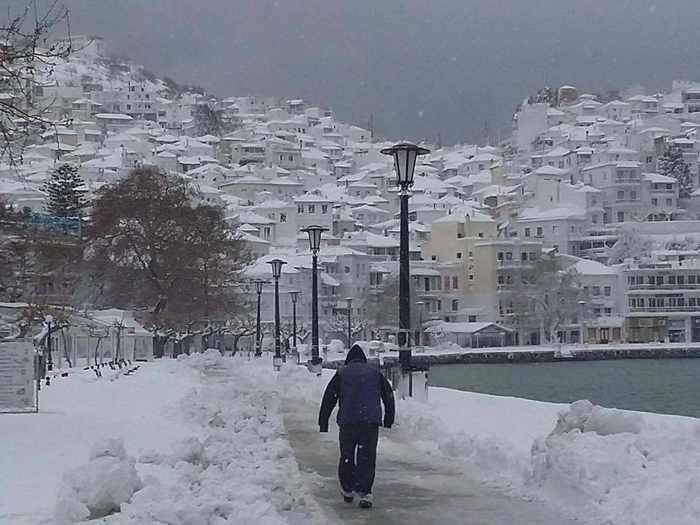 Scenes of streets knee-deep in fluffy soft snow are something I would expect from most places in Canada this time of year, but not on Greek islands like Skiathos, Skopelos or Evia! 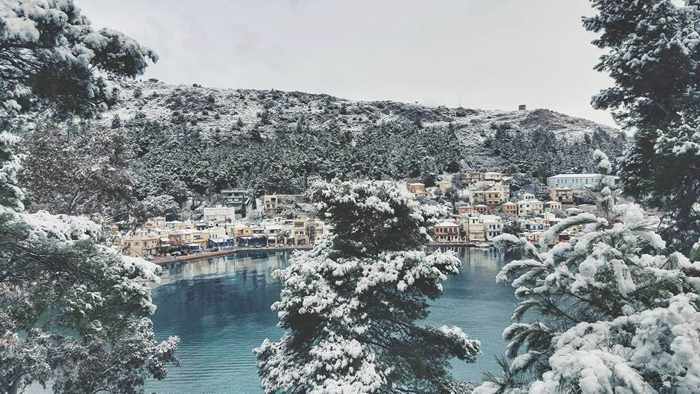 I find the images particularly impressive because they show how spectacular Greece looks even in extremely severe weather during a season few tourists get to see and experience. 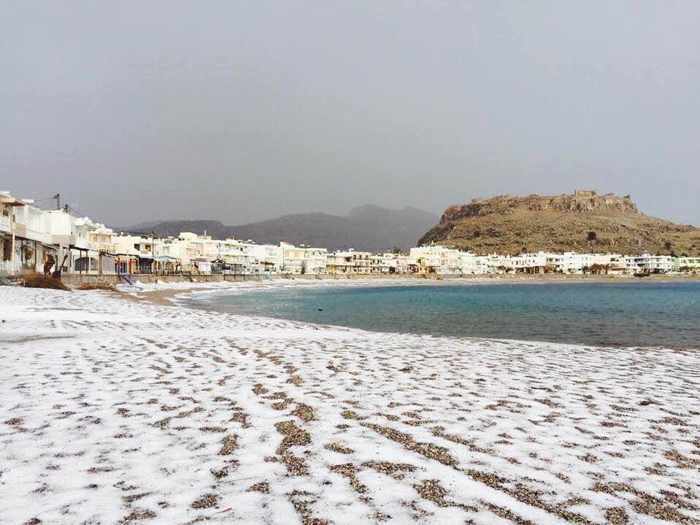 If, like me, you have only visited Greece during spring, summer or fall, you probably will be pleasantly surprised to see just how striking and amazing various regions looked during the cold snap that has gripped much of the nation since Christmas. 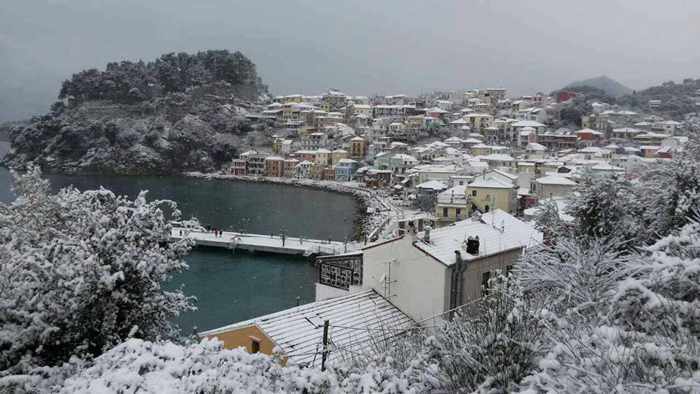 Below are photos of wintry scenes in several popular Greece destinations, followed on page 2 of this post by dozens of photos from Athens, Rhodes, Chios, Evia, Skiathos, Skopelos, Skyros, Sparta, Mystras, Lakonia, Corinth and Ioannina. Part 2 includes photos from Crete, Nafplio, Epidaurus, Thessaloniki, some of the Cyclades and Ionian islands, plus various locations in the Peloponnese and mainland Greece. 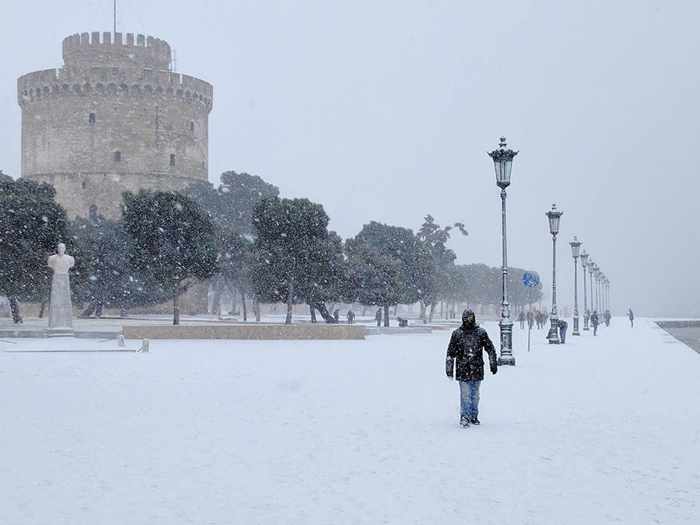 With links to scores of additional snow pictures and videos, this two-part feature is one of the most comprehensive collections of Greece winter storm photos you’ll find in one spot. 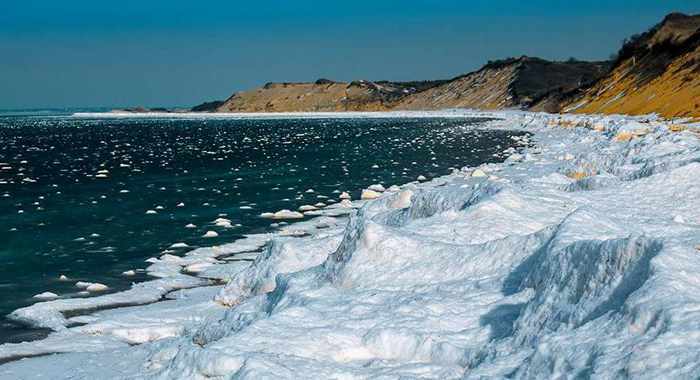 So bundle up and enjoy a photo tour of winter wonderlands in Greece! 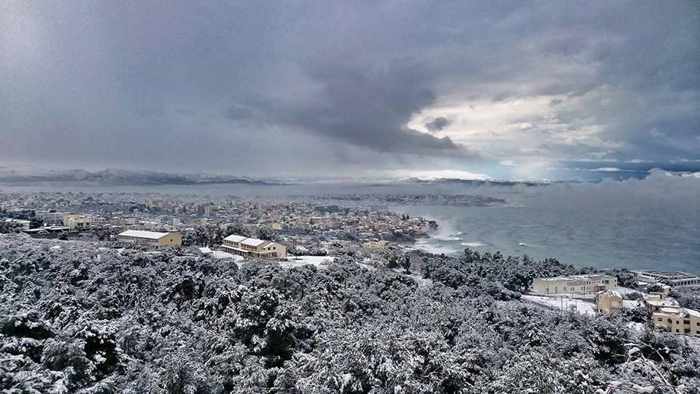 Evia island (also spelled Evvoia and Euboea) was one of the places hardest-hit by snowfalls, with some regions receiving nearly 2 meters of white stuff. 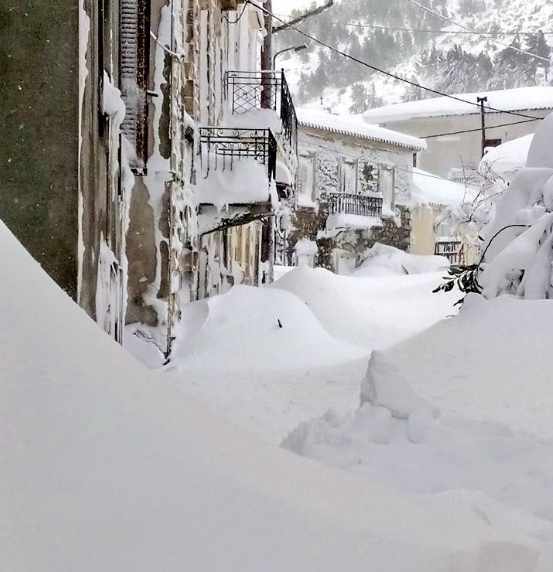 Constantinos Mg photographed this snow-filled street in Kymi. 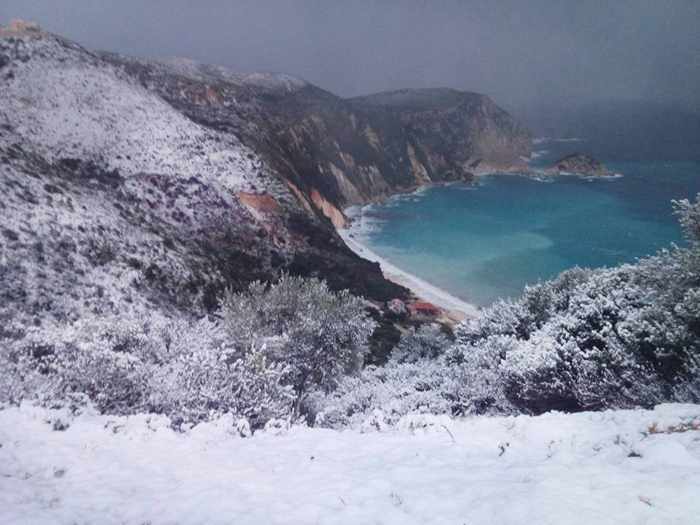 Myrtos beach on Kefalonia after a snowfall. The image appeared on the Amazing Greece / Incroyable Grèce Facebook page. Sunshine illuminates one of the churches at Mystras, a UNESCO World Heritage Site near Sparta. 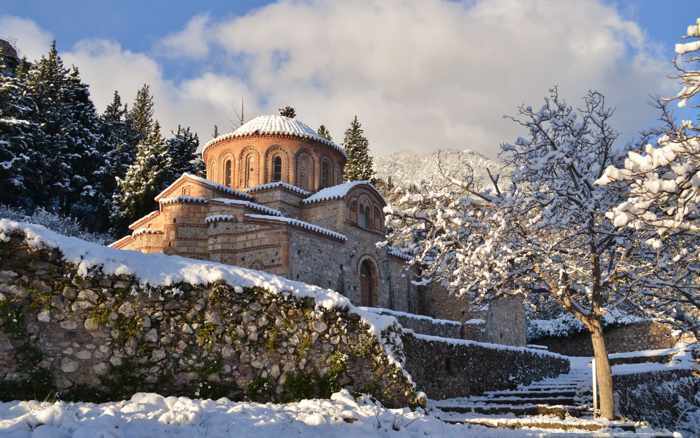 The image appears in a collection of Mystras snow photos published on the Evrotas blog of landscape photography from the Sparta region. Please click on the link below to view more photos on page 2 of this post. This is a 5-minute promotional clip that the travel portal Incredible Crete shared on Vimeo to encourage tourism to Greece’s largest island. The island is so vast and scenic that such a short film can give a mere fleeting glimpse of the myriad amazing sights to see and things do there. But I’m willing to bet this short clip will quickly convince you that Crete is indeed incredible! 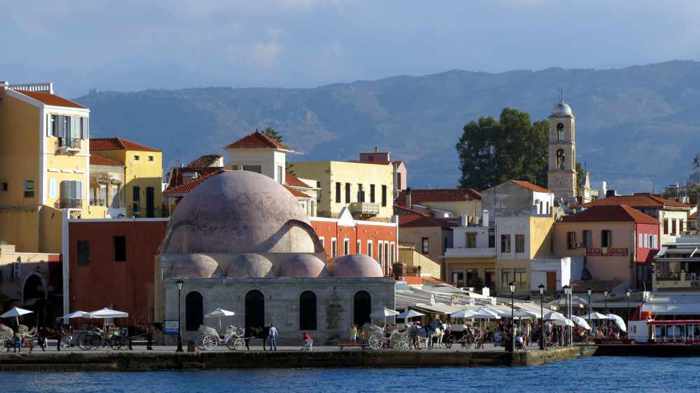 Click on the white arrow to start the film and commence your video tour of Crete.